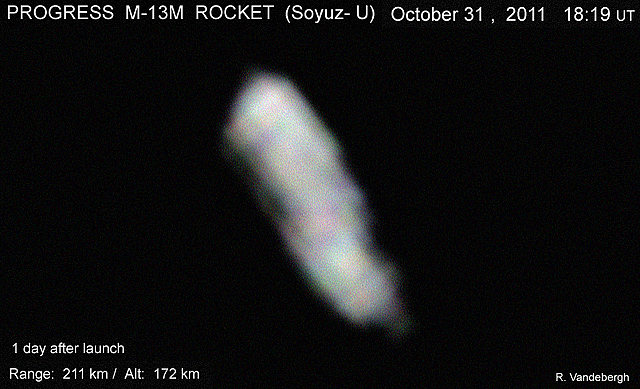 On October 30 at 10:11 GMT, the Progress M-13M cargo ship was launched to the International Space Station. It was the first Progress launch on top of the Soyuz-U booster after the failure with the Progress M-12M on 24 August this year. The cause was a 3rd stage failure. The Progress and the third stage crashed in Siberia, resulting in the loss of 2.9 tons of supplies for the space station. The cause turned out to be a faulty gas generator in the Soyuz’s third stage engine. It was the first time in 135 launches, starting from January 1978, that a Progress failed to reach orbit. The launch of the Progress M-13M went well, and I was able to see the third stage fairly well visible in the evening sky on October 31 during a West-Northwest to Southeast pass with 54 degrees culmination in the south-Southwest. The rocket was followed by the Progress itself after 27 minutes, in a lower and much fainter pass. Apparent speed of the rocket was high as expected. Its altitude was around 170 kilometers. Unfortunately, a cloud-field approached from the Southwest, covering the rocket pass by almost 70 percent. I managed to capture a few frames with the rocket in a favorable attitude to the observer anyway. As far as I was able to determine in the remaining visible part of the pass, no flashing was visible. This does not mean that the upper stage is not tumbling: I have often noticed that passes of a Soyuz rocket through the South appear steadier than through the North. This probably is caused by the lighting angle and position. It is a phenomenon that I have yet to investigate. Unfortunatly, I had too few frames to determine tumbling this time, as I was able to do during previous more favorable passes.